Editor’s Note: On Sept. 23, 2013, Roger Conrad and Elliott Gue will host a free webinar on their top three publicly traded partnerships for 2014 and beyond. Don’t miss out on this opportunity to learn about these under-the-radar stocks before the crowds rush in. Register for this must-attend webinar today. First let me say for the record that I’m not opposed to short selling or short sellers. And while I don’t issue a market opinion without first putting in the hours on research, I’m fully aware that my colleagues and I miss things, despite our best efforts. NuStar management has now pushed back the date several times for when profits will cover the payout once again. Previous statements of a return to distribution growth were nowhere to be heard in the second quarter conference call. And while near-term refinancing needs are minimal, debt is growing rapidly as the company continues to build more fee-based energy assets. Finally, NuStar continues to suffer from losses at the portion of its business that’s still tied to commodity prices, mainly asphalt production. The division has been deconsolidated from other operations by the sale of a 50 percent interest. But it continues to take its bite out of profits. The bottom line is sooner or later, the fee-based assets NuStar is building are going to have to grow cash flows fast enough to cover its distribution, offsetting the asphalt losses and the dilution from recent debt and equity issues. So long as they don’t, there’s rising risk of a distribution cut that would dramatically widen the MLP’s losses so far this year. That’s the message behind decidedly negative Wall Street opinion of no buy recommendations, versus nine holds and four sells. 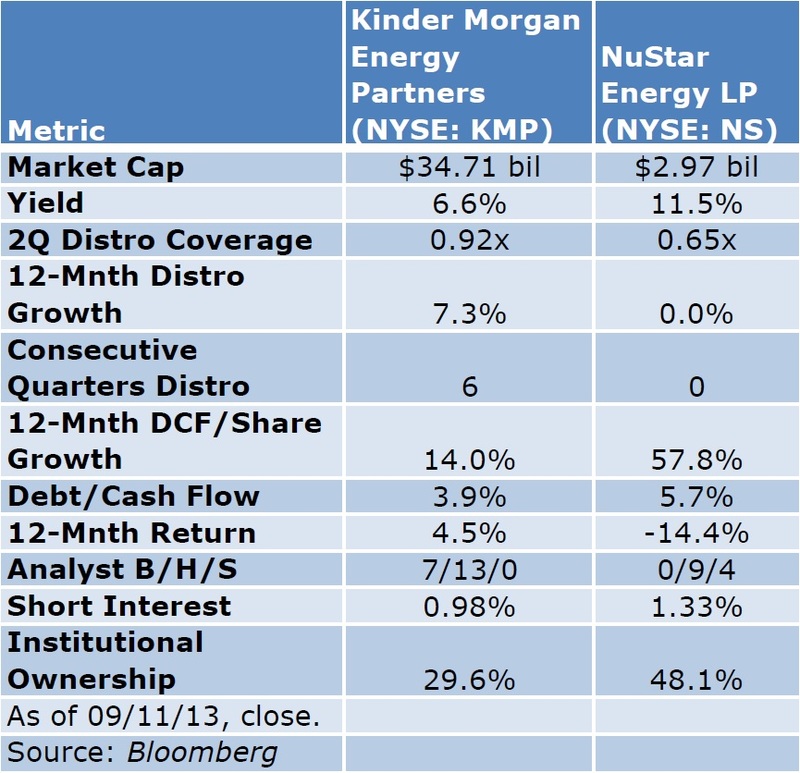 So why did Hedgeye target Kinder over NuStar? Only they can say for sure. But I see several possible explanations. First, as my table “Softer Target” shows, Kinder has a much higher percentage of retail investor ownership, as opposed to institutions. 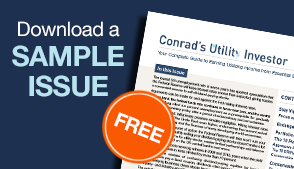 As I’ve noted before to Conrad’s Utility Investor readers, the big boys have a finite time horizon for performance that makes it very tough to hold onto an underperforming value, or to ignore a high flyer buoyed by buying momentum. The reputation of retail investors, however, is that they’re more prone to making emotionally based investment decisions. In fact, Hedgeye cited this as backing for its contention that Kinder is chronically overvalued. Another reason for picking Kinder over NuStar is the latter is already down considerably this year and has substantial short interest already. Since I recommended NuStar as a sell in CUI’s sister publication Energy and Income Advisor, for example, it’s fallen from low 50s to high 30s. If they should cut their payout, NuStar would likely come down a bit more. But barring some kind of outright catastrophe, most of the money has already been made here on the short side. Kinder in contrast has a positive return for this year. That means if Hedgeye is right—or even if it just convinces enough people it is to sell—short positions are going to make a lot of money. It’s worth pointing out that Hedgeye’s last high profile target Linn Energy (NSDQ: LINE) was a very profitable short earlier this year. That’s despite the fact that the oil and gas producer MLP is still on track to complete its merger with Berry Oil (NYSE: BRY), a deal management has stated will trigger an immediate 6 percent distribution increase. This week, management released an update setting September 30 for a shareholder vote on the Berry deal. It also announced another $525 million acquisition, which as my partner Elliott Gue noted hardly sounds like a company worried about the Securities and Exchange Commission. 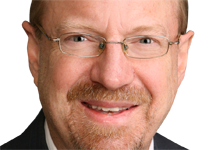 Linn’s deal still has some bridges to cross, and it’s true that production was disappointing in the second quarter. But it’s starting to look like there’s a whole lot more upside than downside with this one. In fact, the trading action this week looks like a short squeeze in the making. Kinder management has chronically under spent on maintaining its pipeline network, a strategy that’s maximized distributable cash flow to its general partner, Kinder Morgan Inc (NYSE: KMI). When the bills eventually come due, it will make paying the current distribution impossible, and collapse share prices for both MLP and GP, as well as related businesses like El Paso Energy Partners (NYSE: EPB). A growing percentage of Kinder’s distribution is being funded by profit from what amounts to a hidden oil and gas exploration and production business that will require a huge amount of capital to maintain output going forward. The company faces a host of legal, regulatory and environmental issues that, if eventually proved material, will impede its ability to pay distributions. The incentive distribution rights structure enjoyed by GP Kinder Morgan Inc is exorbitant, well out of line with other MLPs and makes it virtually impossible for management to make capital decisions conducive to long-term enterprise sustainability. These concerns are wholly unrecognized by investors who value the company based on yield, which if cut could bring downside in the unit price of up to 50 percent. Those are serious charges to be sure. Hedgeye does state in its report that it sees no immediate catalyst for any of these concerns to take Kinder down. But it assures its customers—who ironically are mostly newsletter readers—that it’s only a matter of time before company results prove its case. So how much water do these charges hold? Here’s my take. Starting with the most controversial issue, IDRs, it’s undeniable that the enterprise’s biggest shareholder—CEO and Chairman Richard Kinder—profits more than anyone from this enterprise. The incentive distribution rights (IDRs) structure is among the most generous to the GP in the MLP universe, a fact that’s been pointed out by Kinder critics for years. That’s a contrast to more popular MLPs like Enterprise Products Partners (NYSE: EPD), which have done away with their general partners and IDR structures altogether. And Kinder has consistently traded at a substantial discount to Enterprise as a result of that. As my partner Elliott has pointed out, however, the key with IDRs is not what the specific dollar amounts or percentages are. Rather, it’s what impact they have on distribution growth for the limited partnership, which depends on enterprise size among other factors. Elliott has compiled a data base of IDR structure for all 50 MLPs in the Alerian Index, including Kinder, for our Energy and Income Advisor readers. The bottom line with Kinder is the additional revenue needed to move the meter to fund distribution growth is actually far less relative to its market capitalization than most MLPs. In other words, the IDR structure isn’t particularly restraining to distribution growth. That’s also pretty much confirmed by Kinder’s record of very reliable distribution growth and consistent distribution coverage. Note that the latter actually improved markedly in the seasonally weak second quarter from 2012 levels—another fact not pointed out in Hedgeye’s report. Turning to point two, it’s undeniable that Kinder’s carbon dioxide division is something of an anomaly in an organization that prides itself on growing fee-based assets. Operations basically consist of CO2 production facilities, energy midstream assets to get CO2 to Permian Basin oil and gas wells for “carbon flooding” and oil wells owned and operated by Kinder that use carbon flooding. All of these operations feature risks that are not shared by the rest of Kinder as an overall organization. Mainly, rather than earn mostly steady fees under long-term contracts, the company competes with other CO2 producers and owners of CO2 midstream assets. And despite hedging virtually all of its oil output, it’s impossible to get everything locked in economically, particularly natural gas liquids. What Hedgeye does not point out, however, is how remarkably steady both revenue and profit has been at KMCO2 over the past 10 years, despite some extreme volatility of energy prices. In addition, the fastest growing piece of KMCO2 is not oil production at all, but CO2 output. Margins here depend on volumes as well as the price of CO2. But at least so far as energy price go, the key element is also pretty much a throughput issue. That is, so long as Permian Basin oil is flowing at a rising rate, the market will be favorable. The bottom line with KMCO2 is it is commodity price sensitive to some extent. And if oil prices plunged to say $50 a barrel, profitability would no doubt decline sharply. I fully agree with Hedgeye that this is a point management tends to downplay and should be more forthcoming about. But neither is this division a ticking time bomb for the distribution. In 2008, for example, Kinder raised its distribution in all four quarters, despite a plunge in oil prices from over $150 a barrel to barely $30. And it continued to raise in 2009, as cash flows from other businesses picked up the slack and KMCO2 largely maintained its margins. Maintaining the same level of oil production from CO2 flooding will depend on adding new wells. That’s the same economics all producers face, and Kinder has addressed that with recent acquisitions. But the real issue with this division is the continued revival of the older oil wells in the Permian Basin with CO2 flooding, which pushes up demand and prices for CO2. And that’s a trend the numbers show is still very much in motion. Energy is fundamentally a dirty business. Even wind and solar facilities, for example, face charges of being environmentally destructive. In fact, the effectiveness of an oil and gas producer’s legal team is arguably just as important as the people who make decisions on reserve development. As one of the largest pipeline owners and MLPs in the US, it should be no real surprise that Kinder faces a range of regulatory, legal and environmental issues—which it discloses regularly in the 10Qs and 10Ks it files with the Securities and Exchange Commission. At this point, however, there’s nothing that stands out as a potential profit crusher. That includes disputes over rates of return on pipelines, including potentially lower resets of return on equity (ROE). That’s not to say there won’t be more in the future. And if Hedgeye really is correct that Kinder is underinvesting in maintenance, we can expect more legal and environmental issues to emerge, from leaky pipes for one thing. The point is though right now there’s nothing extraordinary to report as a potential downside catalyst. The same goes for the maintenance capital issue in general. Mainly, Kinder spends about what its rivals do. You could certainly make the case that all MLPs systematically under fund these expenditures, particularly in an era where public tolerance of any environmental fouling is so low. But the charge of underfunding CAPEX to maximize Richard Kinder’s stake is pure conjecture at this point. And if that does change, we’re going to see it in deteriorating safety and performance, which we have not to date. Finally, I would wholeheartedly agree that investors have bid many MLPs up to crazy valuations. But with a yield of some two percentage points above energy midstream industry favorites like Enterprise, Kinder is clearly not one of them. Should this MLP’s business results really weaken going forward, it would arguably deserve an even lower valuation than it currently has. And should that happen, it will be time to reevaluate positions, just as it would be for any other stock or MLP. At this point, however, none of these charges against Kinder Morgan Energy Partners appear strong enough or sufficiently substantiated to make the MLP an unqualified sell, let alone a potential short sale. In fact, it looks like one of the few bargains in a space that’s been bid up dramatically over a four years plus bull market. 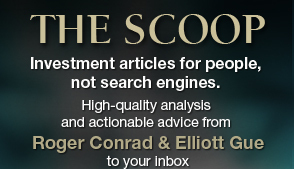 Roger S. Conrad is founder and chief editor of Capitalist Times, Conrad’s Utility Investor and Energy & Income Advisor. He and Elliott Gue will host a FREE webinar highlighting their three favorite MLPs for 2014 and beyond.